Every dancing water speaker looks and functions differently, hence creates a unique mood. It is for this reason that you shouldn’t just pick the first speaker that crosses your view. Proper consideration needs to be taken to prevent sending the wrong message. Below are 10 of the best water speakers available in the market today. With the “Pros” and “Cons” of each unit, together with the short buying guide at the end, you will make an informed decision and get the ideal unit. This is the only globe shaped water dancing speaker in this guide. It makes it to our list because of its good functionality and endless positive reviews. 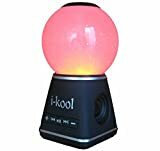 The main selling point of the I-kool water dancing speaker is however not in its shape; it is in its ability to change the color of water. You can change the colors from blue to green to white and to red depending on how you like it. Apart from this beautiful light show, at the center of the globe is a cyclone. The cyclone changes its shape, size, and speed based on the volume, pitch and the beats being played. These water speakers come with 3 options via which you can connect to the unit: via the auxiliary cable, through Bluetooth, or by inserting a MicroSD card on the unit. The sound, though not very impressive, is still decent. If you decide to go for these speakers, there are six color options from which to pick from. Each of them offers amazing sound quality thanks to their relatively high power rating of 5W. their volume is high enough to fill a small-medium sized room for the best sound performance. Each unit in the pack has 4 multicolored LED lights that light the water as it comes up from the base to create a visually stunning effect of a water show. Their frequency ranges from 90Hz to18kHz making them perfect for home parties to delivering high quality, crystal clear sound. The higher the volume levels, the higher the water is pumped. 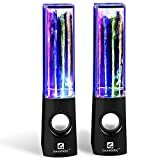 These water dancing speakers can connect to virtually all devices provided they have a 3.5mm audio jack. If you are on a budget, and still are looking for the best dancing speakers, the e-joy is highly recommended. Contrary to most expectations, these speakers give decent bass responses. Even at very high volumes, you can expect to hear little to no audio distortion. On the downside, these speakers cannot be more than two feet apart as one needs to be connected to the power source and the other to an audio source for them to work. Gone are the days when dancing water speakers were thought of as kid’s toys. Everyone has got a standard speaker, but only those who want to light up their homes have water speakers. 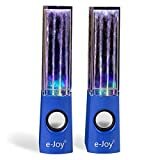 One such speaker that can be used to light up your home is the E-joy 22771 dancing water speaker. It is made of high-quality plastic and has a deep black theme. This black theme is what makes these such wonderful accent pieces: it enables the LEDs to be visible even during the day. They come as a set of two wired speakers so you will need to place them close to the sound device. Each of the speaker in the pack has 5 watts, so they are a little bit louder than most in this guide. You also get 2+1 sound drives and 2.0 RMS channels with a 90Hz to 18kHz. As they are small, compact, and produce a decent sound volume and quality, they are a perfect choice for the outdoors too. All you need to enjoy your water show is a USB cable or AUX cable. It works with a number of audio devices. 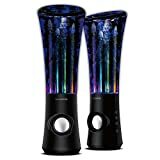 To connect the Aolyty Colorful LED Dancing Water speaker, you need to have a 3.5mm headphone jack. It comes fully assembled requiring you to only power the unit and connect the jack. 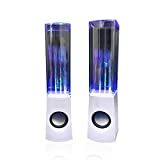 Aolyty LED Dancing Water Speakers are a set of two speakers, each measuring 9.7 x 5 x 3 inches so they won’t take up much counter space. Each speaker has 5 LEDs that put on a very beautiful show as you play your music. With the lights switched off, these LED lights are fully visible, but in normal light, though the show goes on, it is not easy to pick up the individual colors. For their size, these speakers have an amazing sound quality. Though not as loud as standard speakers, it is clear and with such a beautiful show, it doesn’t really matter. Of all the speakers in this guide, personally, these are the best looking ones. They are sturdy, well engineered and are all leak-proof, capable of serving you for lots of years. The transparent case is made of acrylic. The use of acrylic renders it virtually indestructible. Acrylic is also non-toxic and has a stain/fade proof design that maintains its lustre for a long time. To properly reflect the LED lights, it uses non-toxic and zero-ignition vegetable oil. There are six LED lights at the bottom of the transparent part, arranged in form of a circle. The best part is, you can control the water dance feature using a button on the control panel. This speaker is widely compatible with a number of devices. In fact, any and all devices can connect to it as it uses AUX cable to play music. You will, however, have to place it close to the audio device or get a longer cable. It requires no set up at all, and with 534 grams of weight, there is no way you can leave your beautiful speaker behind as you travel. Cheap doesn’t necessarily mean low quality and there are many cases, including this one, that can attest to this fact. For a very low price, you can get these professional-grade water dancing speakers. They come as a set of two to deliver to you the highest-quality surround sound. It is very lightweight so you can move it around. This is furthered by its relatively short stature of nine inches. The glass part is made of acrylic and polished to give a durable and smooth surface. The sound quality you get from these small units is remarkable. Thanks to the inbuilt amplifiers, these speakers are also usable as TV or DJ units, delivering amazing surround sound. In terms of aesthetics, these speakers are sure to add some color and glamour to your internal decor. They have a simple design with an intuitive control panel at the front to give you full control of the music without having to fumble with your device. The colored LEDs produce the beautiful lights inside. What’s more, these units use non-toxic oil to disperse the light well. As they come preconfigured, you only need to plug it into the power outlet and connect your 3.5mm headphone jack. 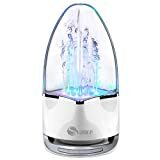 These dancing water speakers by SoundSOUL overcome one of the main problems associated with water speakers, connectivity. Most options, including some in this list, have only one mode of connection – 3.5mm headphone jack. These have restrictions on how far from the music player you can place your speakers. These are Bluetooth enabled. That means you can place them as far as in the next room and still enjoy the same beautiful show. Though incomparable to the quality of sound from standard speakers, they are actually quite commendable. They have the control panel located at the front of the unit rather than the sides, making it easier to control music and volume. From form to function, the Sharper image SBT5013 has a lot to offer. It comes containing three components (not counting the accessories such as cable and adapter): a subwoofer and two speakers. The subwoofer is a square unit containing the bass speaker and no water or LED lights. It acts as the control panel and it is to it that we connect the auxiliary cable if we plan on going the wired route. If we prefer the wireless route, we use it to connect to the Bluetooth of our audio device. It produces beats and deep basses in a much better and clearer way than when using the other tutor speakers. This subwoofer also allows you to adjust the bass levels. This prevents it from being distorted and sounding muddy at high volumes. 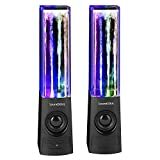 The other two speakers take the shape of a cone and have water fountains with LED lights that put on a wonderful show when the music starts. The Bluetooth connection to the unit is quite strong and you won’t hear any dips in sound quality from start to finish. This speaker can fill a medium-large room with ease. Svance is a reputable brand with a number of quality products so you should expect this portable model to continue with the tradition. Thanks to its compact design, it doesn’t clutter counter space. All the materials used in its design are high quality so you can expect it to last a very long time. This water speaker has half-an-egg shape with a sturdy base. There are three modes via which you can play your music. If you have a phone, laptop, or any other sound device, you can connect it to the speaker either via the 3.5mm headphone jack or through Bluetooth. If you do not have a sound device with you, you can just connect a TF card to the unit for the best water show. You will love that it dances to the 360-degree music it produces. Apart from the two speakers, the package contains an AUX cable, silicone stopper, charging cable, user manual and a one year warranty. 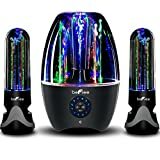 BeFree Sound BFS-33X water speaker is different from almost all the others in this list because it comes with a subwoofer for punchy beats and overall bass. The subwoofer is not only responsible for the rich sound performance, but it is also the control hub. It is via it that we connect the Bluetooth for a wireless experience and also control volume, tracks, and power the unit on and off. The difference between the subwoofer on this unit and that of the Sharper Image discussed above is that this one has the LED lights and the water while the other doesn’t. Additionally, this one doesn’t let you control bass levels like the one by Sharper Image. Apart from Bluetooth, you can also use the auxiliary port to play music. Apart from the subwoofer, there are two other smaller and differently-shaped speakers. Each of the three components of this BeFree speaker has a beautiful water fountain with LED lights for visual appeal. The inclusion of a subwoofer gives this number #1 best water speaker an edge over all the others in this guide. They can fill a medium-large room at full volume without any distortion. The only downside to this unit is when the volume is below 20%, the water fountain does not move. You will have to crack up the volume if you want to see the water fountain show. You should check for the following attributes to get the best value for your money following the purchase. Sure, the main reason you want a water speaker may be the aesthetics, but keep in mind that they are speakers; they are ultimately built for sound. That said, the water speaker you go for should offer the most in terms of sound. What is the speaker size? What are the drivers? You can get this information from unbiased customer reviews. What works for me may not work for you. As you may have seen from the above, these products are available in different shapes, sizes, and colors. A water speaker to be used as a countertop will be very different from that to be used in a party. With that, you should carefully consider the intended use to prevent errors. Ease of use stands for the complexity of set up and control. You wouldn’t want a unit that would need ten minutes each time you want to listen to your favorite jam. There are several plug and play models that are best, especially if you are in a hurry. There are three main ways in which speakers connect to the audio devices. Via insertion of a MicroSD card, via an auxiliary cable, and via Bluetooth. The one you go for should especially match your intended use. For example, going for a Bluetooth option because it lets you control the music when installing in your kid’s room. The chances of choosing the wrong product are heightened when you rely on impulse buying. As such, it is not only important but also financially healthy, to have a planned out budget before getting to purchasing. To listen to music in style, you should get one of the above ten best water speakers reviewed herein. They are very stylish, relative to standard speakers. More interestingly, they are clutter free, will be adored by kids, make wonderful gift ideas, and have systems that can connect to virtually all audio devices.